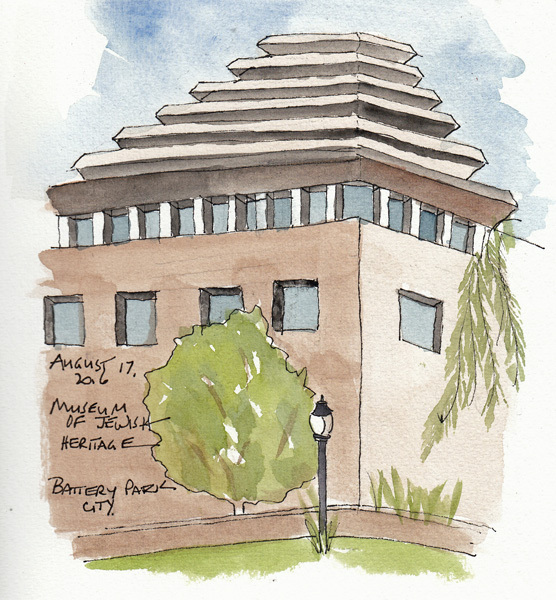 The Museum of Jewish Heritage, in Wagner Park, is great to draw. This is actually part of the back of the Museum that I walk by when going to South Cove for figure drawing. We try to spend time with one just one grandchild when we can schedule a full day. 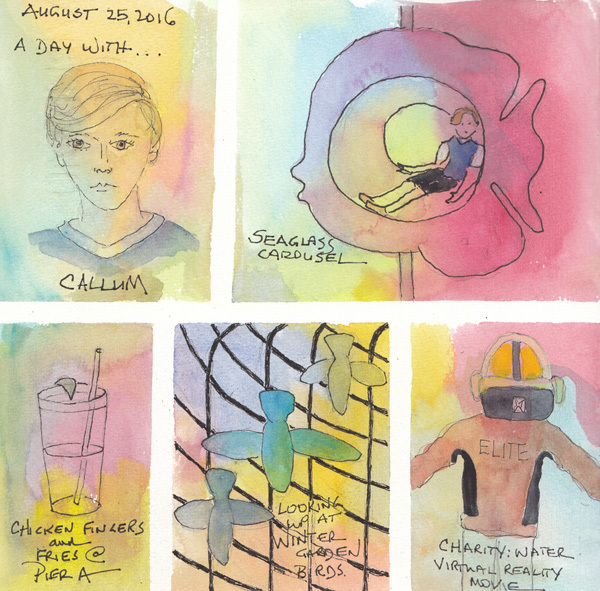 Yesterday was our long awaited day with Cal, who asked about a visit to the Seaglass Carousel and the Oculus for at least the last 3-4 months. We caught him between summer sleepaway camp and the rest of his vacation! Yesterday morning I divided a sketchbook page with 1/4" artist tape and prepainted the background. Then I added quick drawings as we progressed through our day. We began with rides on the Carousel, then walked around Battery Park for lunch at Pier A. 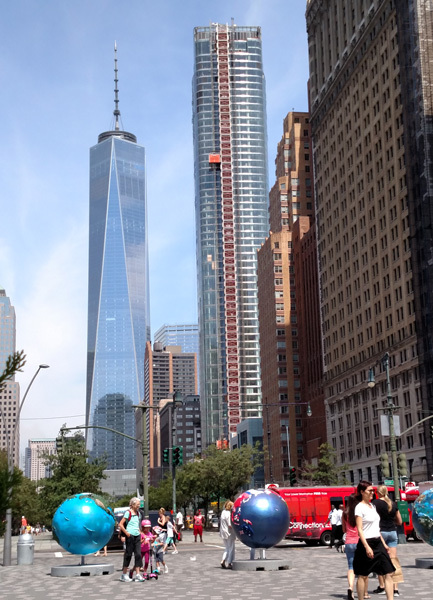 The view of the Freedom Tower (WTC1) is great when looking north up West St. and we stopped to draw it as we left the restaurant. Cal likes to draw and we stopped several times during the day to draw in our sketchbooks while Grandpa worked on the NY Times crossword puzzle. 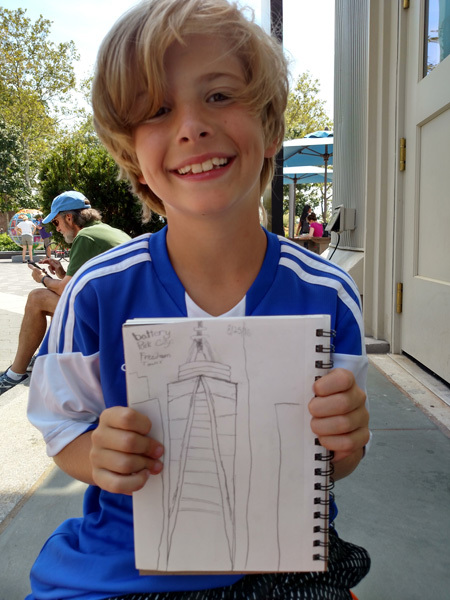 This was his quick sketch of the Freedom Tower. The rest of our adventure included Brookfield Place and a Virtual Reality Movie about bringing water to Ethiopia, the 9/11 Memorial pools, the Freedom Tower up close, and the exterior and interior of the Santiago Calatrava Oculus. 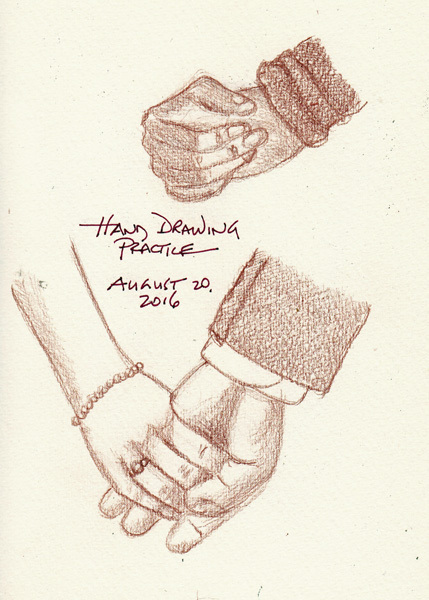 I find drawing hands and feet to be very difficult, and years ago began a self-imposed practice of drawing both from photos found in magazines and catalogues. 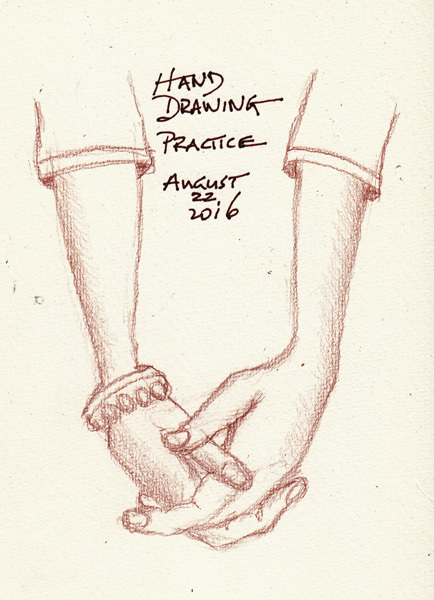 My most recent drawings are of two hands together. At figure drawing sessions, there is rarely enough time to devote to either in any detail, but occasionally I am able to focus on a hand or foot, and slowly I'm improving. Both of these pages were drawn with a colored pencil on cold press paper. 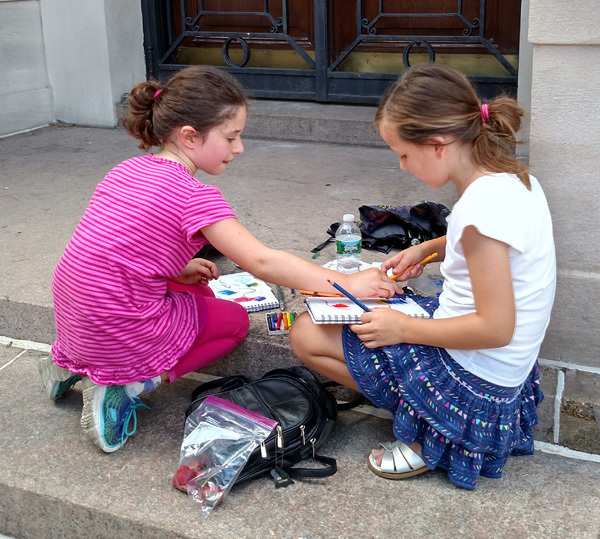 On an incredibly hot day in NYC, there was wind in BPC - wonderful outdoor sketching weather. 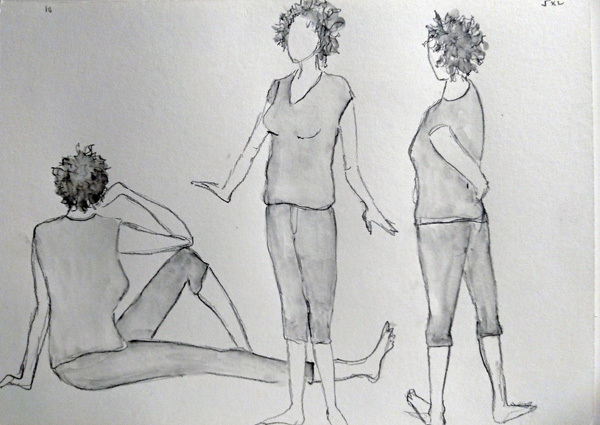 These are three 5 mniute poses, each drawn with A General Sketch and Wash pencil and then shaded with a water brush. 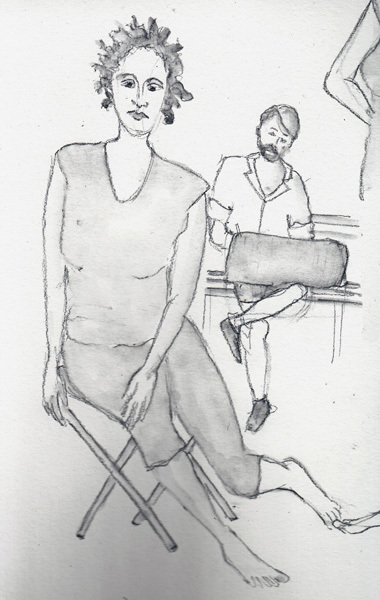 I rarely can keep sketching through a 20 minute pose, so in both of these I sketched one or more artists in the background. New York City is in the middle of a heat wave! 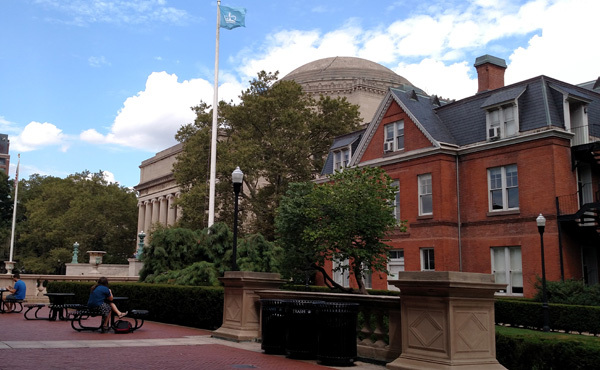 The NYC Urban Sketchers Weekday group met on the campus of Columbia University on Thursday and it was unbelievably hot. I went into St. Paul's Chapel with my grand daughter and another 8 year old who was also joining our group with her grandmother. 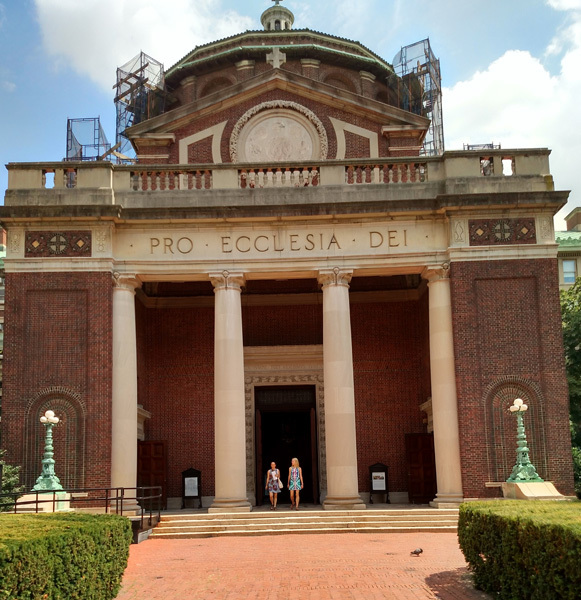 This is the front of the chapel. 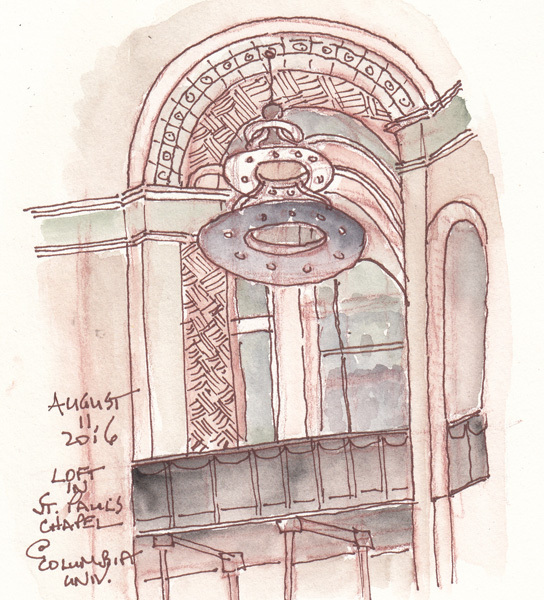 St Pauls Chapel Interior: There were 4 large fans set up in the sanctuary and we found a place to sit while I sketched what I could see from my cool seat. It was a side alcove with a beautiful stained glass window, a loft, and a decorative chandelier. The perspective was a challenge for me. The girls sketched and painted the chandelier. 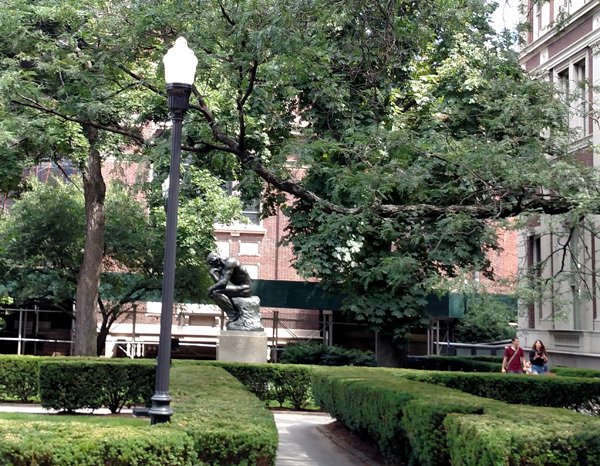 In an adjacent campus square, in front of the Philosophy building, there is a Rodin Thinker sculpture. 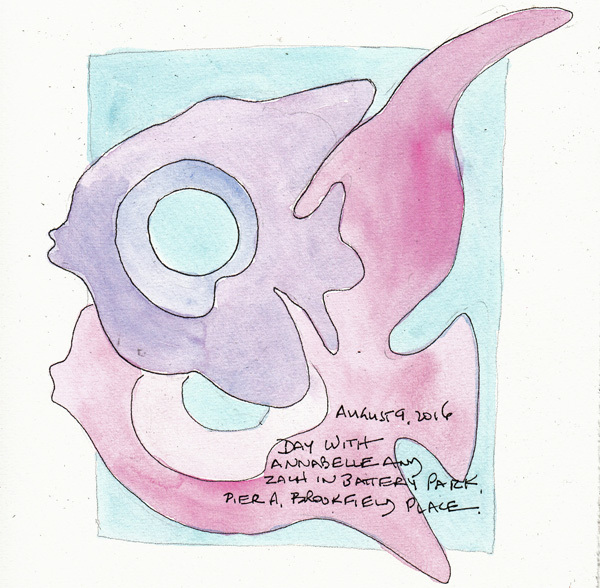 It was hard to find a spot of shade close to the statue, and I didn't finish my sketch. Many members of our group sat on the steps of a facing building - and this was our view of the Rotunda of Low Library. 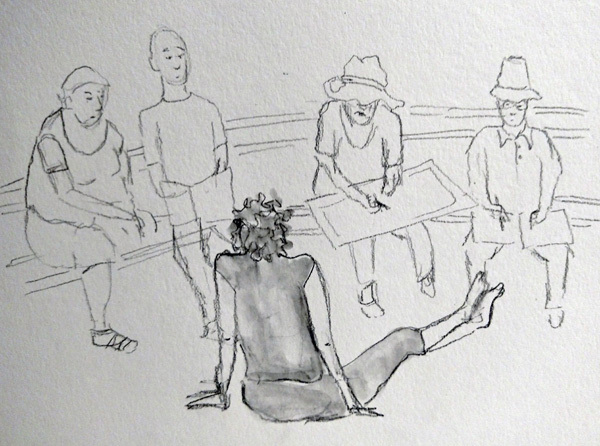 There were a few members of our group that sat in front of Low in the sun and did wonderful sketches. Not me! As we sat and talked while eating our lunch, my grand daughter Annabelle and her new friend Quinn had a wonderful time mixing colors from a set of watercolor pencils. They were incredibly enthusiastic and energetic, in spite of the heat. It was a wonderful place to sketch, but brutally hot. We decided we would return in the Fall! Our Grand daughter is visiting us for a week from DC, and she has time alone with us and liberal doses of her cousins who live in the City. We took a trip to Roosevelt Island (which is in the middle of the East River) on Monday to show my husband and grand daughter the Tram to the island and the FDR Memorial. 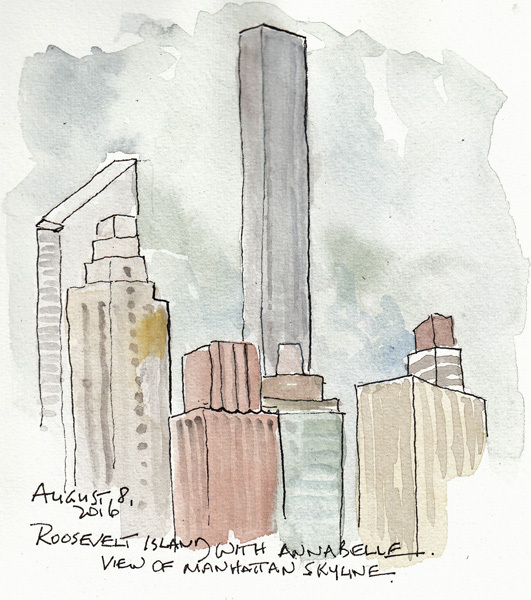 We stopped for what seemed like only 5 minutes to sketch a building on the Manhattan skyline while walking on the Memorial grounds, then had lunch, and took the tram back. Annabelle loved the tram as much as I do. I chose to sketch this portion of the skyline to capture the new mega skyscraper which is near the Citicorps building (slanted roof). On Tuesday Annabelle's cousin, one of our grandsons, joined us for the day in Battery Park and Battery Park City. 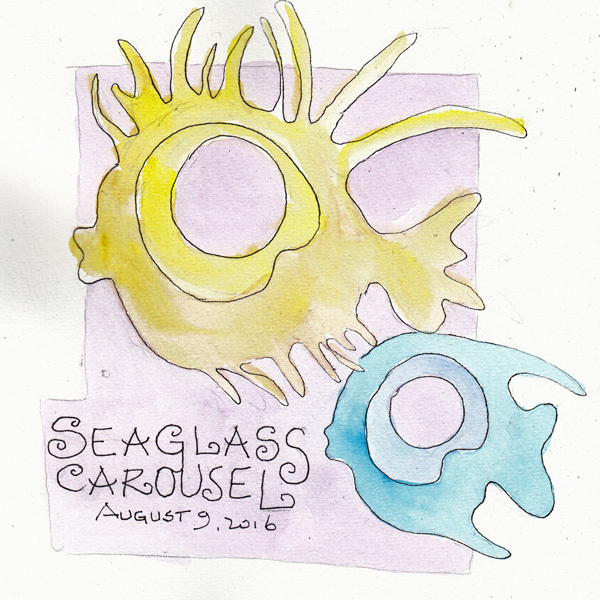 Zach requested a ride on the SeaGlass Carousel and while they each had two rides, I finally sketched a few of the iridescent fish that you sit in. 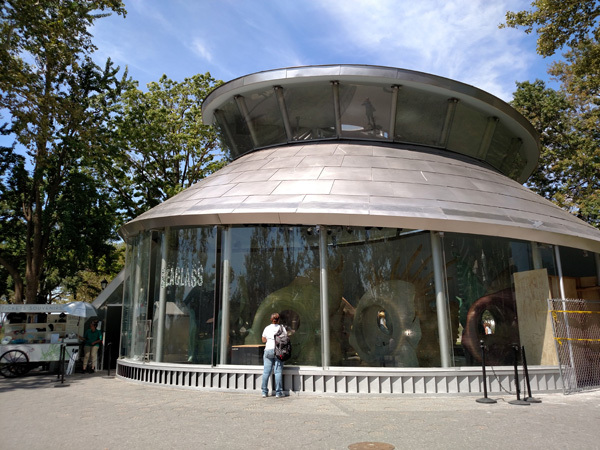 This is the Carousel, inside a nautilus shell. 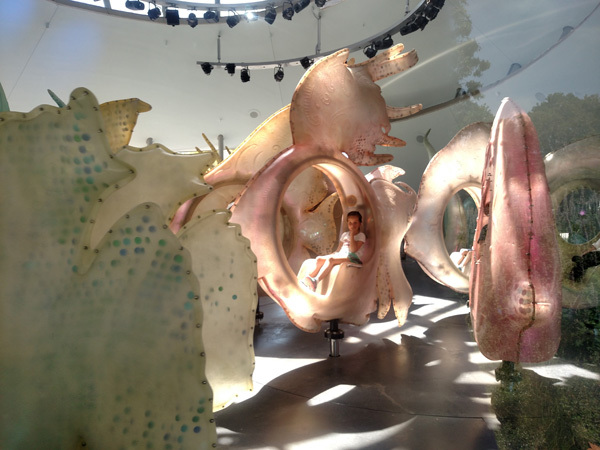 Here is Annabelle sitting inside a fish. Here are two sketchbook pages. Today Annabelle and I will go to Broadway to see the musical Cats which just reopened after a 15 year hiatus. We saw it in the Summer of 1983 with our children and when Annabelle's Father was 10 years old.